Earlier this month, Myanmar (Burma) signed a series of memos of understanding (MOUs) for joint construction with China to build the China-Myanmar Economic Corridor (CMEC), which is part of China's Belt and Road Initiative (BRI). The CMEC will focus on 12 areas including basic infrastructure, construction, manufacturing, agriculture, transport, finance, human resource development and telecommunications. According to the CMEC proposal, construction will begin with 24 projects costing $2 billion at the beginning, increasing later. The corridor will start from Kunming, the capital of China’s Yunnan Province. It will continue for 1,700-kilometers, through Myanmar’s major economic hubs, ending at Myanmar's deep sea port in Kyaukphyu in Rakhine State on the Bay of Bengal, leading to the Indian Ocean. The project will create thousands of jobs for Burmese workers, but it will provide far larger benefits for Chinese companies and workers. The proposal claims that the CMEC would allow a direct flow of Chinese goods into the southern and western regions of Myanmar and that Chinese industries could transfer into Myanmar in order to abate the rising labor cost and overcapacity of China’s industries. It said that Myanmar would become a major trade hub for Chinese goods, between China, Southeast Asia and South Asia. Thus, the proposal indicates that this will be a huge boon for China's industries. China is already developing the China-Pakistan Economic Corridor (CPEC), connecting Xinjiang province in northwest China through Pakistan to the Gwadar port and the Indian ocean. CMEC would provide a second corridor for transporting Chinese goods to the Indian Ocean, this time from Yunnan province in southwest China. Since November 2017, when China announced the proposal to build CMEC, Myanmar's public and media have raised a number of concerns. First, the CMEC project runs ethnic conflict zones in Shan and Kachin states near the border with China, and and in Rakhine State, near the border with Bangladesh, where ethnic Rohingyas have been subjected to genocide and ethnic cleansing by the Burmese army. The project could provoke further conflicts in these ethnic areas, and even subject the project and the Chinese workers to terrorist attacks. This is already happening in the Balochistan region of Pakistan, affecting the CPEC project. Second, the Burmese public is very aware of the "debt trap" issue, where China funds the infrastructure project with billions of dollars that have to be paid back, or else forfeit land and infrastructure that has been put up as collateral for the loans. The Burmese are very well aware Sri Lanka lost its $1 billion Hambantota seaport in exactly that way, and now the seaport and a substantial amount of land around the seaport are occupied by the Chinese and thousands of Chinese workers. As I've described in the past, China structures the aid agreements without concern for whether the loan can be repaid, since China then has the option of taking control of the country's infrastructure in case of default. As I explained, it's actually worse than that. China loans the money to the country, and requires that it only be used to pay the salaries of Chinese workers, and to purchase parts and equipment from Chinese factories. So the money is immediately returned to China, but still has to be repaid, so the country is effectively forced to repay the loan twice. After default, and the Chinese take control of the infrastructure project, there is an enclave of Chinese workers and their families who will be there forever. Myanmar's Kyaukphyu seaport is not the only project facing debt-trap concerns. 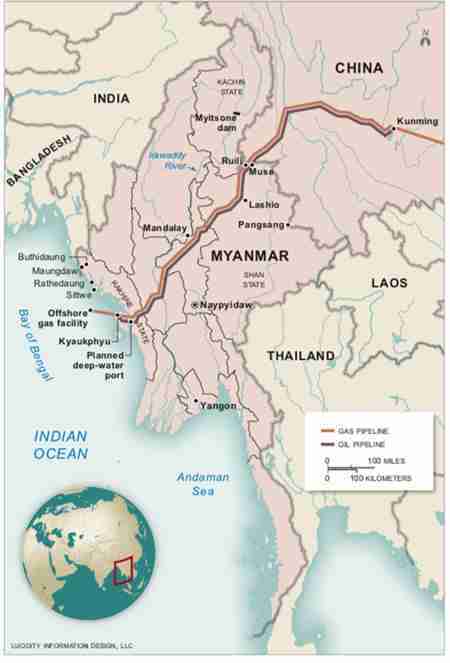 For the CMEC agreement, there are industrial zones, railways, roads and other infrastructure projects to be built along the corridor for which Myanmar cannot find financing. In a bit of black humor, Ning Jizhe, head of China’s National Development and Reform Commission (NDRC) claimed that China's BRI projects are not a debt trap. He said the countries with debt problems have long-standing high debt levels which shouldn’t be blamed on the BRI. But of course it's exactly people with debt problems that loan sharks and payday loan operators prey on by offering extortionary loans and then sending thugs out to collect the loans in whatever way they can. Myanmar's government in fact dropped a couple of projects related to the Kyaukphyu seaport in July, in order to reduce the amount of debt. However, the initial loan will still be $2 billion. However, there are several reasons why Myanmar felt forced to go ahead with CMEC proposal, even though it's almost impossible that the debt will be repaid. First, Myanmar is an economically weak country which, even in the best of times, is unable to borrow money due to lack of transparency in its government expenses and its relationship with China. According ton one analyst, "Raising capital overseas will also likely be challenging given that foreign investors will likely find it difficult to determine Myanmar’s creditworthiness due to the lack of information." Second, the United States is imposing sanctions on Myanmar, and Australia is considering doing the same, because of the genocide and ethnic cleansing of Rohingyas in the last seven years. Myanmar has been extremely successful in its genocide and ethnic cleansing efforts. Genocide and ethnic cleansing efforts by Bashar al-Assad in Syria and Joseph Kabila in DR Congo have not yet been successful, and are still ongoing. But Myanmar appears to have pretty much completed the job. The sanctions mean that whatever Myanmar's chances of borrowing money internationally in the past, it will be almost impossible after the sanctions are imposed. The threat of sanctions is isolating Myanmar even further, so that its closest friend in China, where government officials really don't care about such things as genocide and ethnic cleansing.